It was a nice surprise to find the multimedia performance of the Cookie a good match for the KC910 Renoir flagship. Except for the reduced internal memory (50MB, compared to 100MB on the Renoir) you will hardly find any difference between the two. And with up to 16GB memory cards supported no one will actually care about the miserly 50MB of inbuilt storage. File browsing is generally fast but when you have a memory card inserted, each time you open the file browser it needs to refresh the image thumbnails. Not much of a problem if you have a small picture gallery, but it could get annoying taking several seconds with a huge number of photos,. But that's a common issue for all current LG handsets. Another drawback is that no matter what file sorting you opt for (date, type, name), the files on the memory card always get listed first. While that might not be much of a problem to most users it doesn't make much sense, really. The LG KP500 Cookie file manager includes separate factory-preset folders for different file content. However, unlike some previous generation LG handsets (and those include even some pretty expensive ones) it has no problem handling user-created folders and the files in them. Boy, were we relieved to see that. LG have vastly improved their image gallery with the latest generation of touchscreen phones and now it offers a really nice touch experience. Flipping through images feels so natural and fluid that it is comparable to the best in the class - the Apple iPhone. And with the Cookie photos on board are of slightly higher resolution than 2 megapixels. You can browse images in portrait or landscape mode just by changing the orientation of the handset. Unfortunately, zooming on an image is a bit slow and works in quite small steps. LG KP500 also features the same image editor as the KC910 Renoir with its wide range of options. First off, you get a creative part that allows finger drawing on images, text typing, clipart watermarking, face morphing, selective colorization, and selective color boosting. Then you have tools for basic image treatment such as rotate, resize and mirror, as well as more advanced photo editing options such as levels, brightness, contrast, color, hue and saturation, sharpness, blur. Red-eye removal is also available. And finally, you can add color effects such as black & white, sepia, negative, glow, etc. The LG KP500 Cookie has a really nice music player and if you wonder what nice really means, we guess better than the Renoir pretty much says it all. The layout is intact and the looks aren't too different but some nice functionality has been added. In fact you will get the same updated music player in the LG Prada 2, which we just reviewed this week. The new stuff is basically the seriously enhanced Album Art visualization and the equalizer presets, which LG touch phones lacked up until now. With the LG Cookie music player you can filter tracks as with any other modern music player - by artist, album, genre, and recently played. User-created playlists are also an option. Naturally, the music player can run in the background. You can control the music straight on the home screen with the dedicated mini player widget. Now that equalizers are available, you can opt for one of five presets or you can turn it off to enjoy the track's original sound. A rating system has also been added, which allows you to give a score of 1 to 5 stars to each track. The LG KP500 Cookie turned out to be quite a skilled musician. 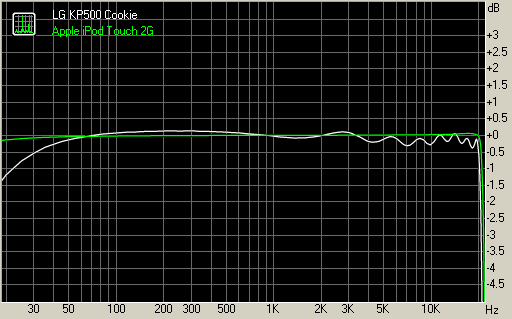 In our regular audio quality test it did very well, with frequency response close to perfect. The rest of the readings vary but are better than most other handsets we have tested. The noise level and dynamic range marks are excellent while the distortion values are quite acceptable. The only problem is the poor stereo crosstalk performance, hinting of mechanical fault. Have a look at the table to see how the Cookie compares to some of the handsets we have managed to test. You can find more info about the testing procedure and more results here.